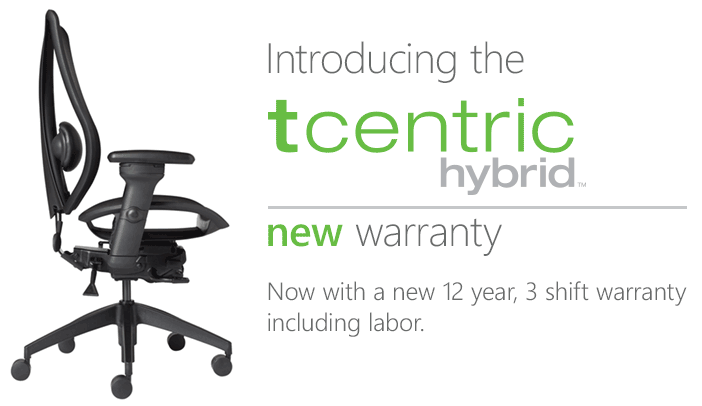 We are pleased to launch a NEW, 12 Year, 3 Shift, Labor Included warranty for the tCentric Hybrid. This new warranty sends a solid message to consumers that ergoCentric stands behind the tCentric Hybrid and demonstrates that we are more competitive than ever before in the high-performance task seating market. Coinciding with the launch of the tCentric Hybrid with Airless Cushion Technology, the introduction of the Controlled Motion Mechanism, as well as the availability of new frame and mesh color choice, this new warranty gives ergoCentric the most comprehensive high-performance task seating offering. Casters, pneumatic cylinders, arms, foam and all moving mechanisms. Is valid up to a weight of 350 lbs. This warranty is effective immediately.